Play Super Mario Bros. and Duck Hunt Now! The Super Mario Bros. and Duck Hunt cartridge is one of the most abundant NES cartridges in existence today. We ourselves have many, many copies. For most of the NES's life, this was the game that came with the system. 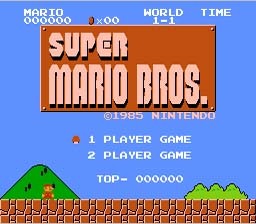 Super Mario Bros. is one of the best selling games of all time. Duck Hunt is also a timeless classic. This was the first game to feature the light gun in the home. The public loved it. Super Mario Bros. and Duck Hunt are both timeless classics and everyone should play them at least once. Save the princess from Bowser and his minions, or go duck hunting with your trusty hunting dog. When finishing a stage you have to jump onto a flagpole as high as you can. To get the highest score possible, be sure to land on the pole as high as possible and try to land on the pole when the clock's last digit is a multiple of three. If you do this, fireworks will go off that give you extra points.